Discussion in 'Hunting, Fishing & Gathering' started by Ahnkochee, Oct 2, 2018. I have a kid sis living in SW Florida, and she reports that they are everywhere there as well as in Miami. I have also heard that they have taken over Puerto Rico. Since they are not native to these areas the locals have no food culture which includes these large lizards. I saw one on Maui 15 years ago, and friend back in the late '60s told me he had them sunning themselves on his back deck in a surburb of Honolulu but for some reason they are rarer than hen's teeth here which I find unusual as most tropical invasives LOVE this place. I read that they are an easy target for air guns, sling shots, arrows, and 22s. My question is has anyone here tried eating iguanas, and if not would you be willing to try? werewolf won, tree-ratsniper, Wasp and 6 others like this. I really love dove and when I tell people how good it is I get the strangest looks. Love frog legs as well. I draw the line at pigs feet and tripe. Wasp, Winterhorse, jasam and 3 others like this. I ran into them a few times in SW Florida and always did my very best to catch one by hand whenever the opportunity presented itself. They are much faster than I would have expected and I was never even able to get close to grabbing one. When you are not trying to sneak up on them they are more than happy to sit still and would make very easy targets for any accurate projectile. Every reptile I've ever tried has tasted about the same; like a combination of fish and poultry. I wouldn't expect these to be any different and I would love to try one. Winterhorse, Primordial, jasam and 2 others like this. I'd eat that. Never have but I'd try it. I read once many years ago that iguana has a higher yield meat percentage yield than cattle. Ranching them was considered. NattyBo, Faiaoga and NWPrimate like this. NWPrimate, jasam and cstrickland like this. Shucks. Can’t be any different than frog,rattlesnake,turtle,or gator and I eat all four as regular as possible. The little speckled geckos have made their way here mayhaps the iguanas will follow. Might be more fun than squirrel hunting. NWPrimate and Primordial like this. I've eaten Iguana killed by machete in the Jungle in Panama working for Uncle Sugar. Had to share my sleeping space with some rather large 8 legged critters too. Gator steaks are much more preferred over Iguana for me. jasam and Primordial like this. I bet they can bite the crap out of you. Even small lizards have powerful jaws. I’d love to try and trap one and eat him. Never had them, but I've eaten other lizards before and and thought they tasted good. I'd love to hunt them with air rifles...or any weapon for that matter! You can easily catch many stationary lizards by slowly extending a noose over their heads on a long pole/stick, as long you do it from behind or way off side of the critter. They are known to have a very strong tail slap when agitated. I have no urge to try iguana, but this past Saturday I caught two fingerling trout... literally fingerling... like, finger length... and I was so tempted to just eat one — “raw and wriggling “ as Gollum says — just to know I could and would. But, I was out by myself and I remembered this NPR story about guys whose last words were “Hey, watch this!”, and many of the scenarios involved eating live fish. Which got stuck. You had chicken Mcnuggets before.... Didn't you? tree-ratsniper, Wasp, clueless on the delaware and 1 other person like this. jasam and Sandcut like this. Never ate Iguana. I used to have a rather large pet green iguana. He was about 3 1/2 to 4 foot long and yes when he was mad he could really whip you with his tail. Ive had it once in Key West Bahama village. Island guy had some grilling on the side of the street. i had a huge nasty male .Over 6ft . Latched on to my mom so hard one day. Right on her chest .Caused a pretty big bruise but about 15years later her doc thought it was a tumor .Nope .Big ole ball of scar tissue . My mom is a tough lady . Iguanas are mainly herbivorous with maybe an occasional bird egg so to me they are a tad more appealing to the palate than a carnivorous reptile but that's just me. tree-ratsniper, Wasp, NattyBo and 2 others like this. It's my understanding that the more colorful males are pretty docile in the wild (especially when sunning themselves). It's the females you don't mess with. I've heard that they will bite and claw fiercely. I have never eaten iguana, but I will try almost anything once. Now, where'd my steak knife go? Aww, c'mon! You guys are slipping. Not one reference to Wall of Voodoo???!!! I'd love to try it. If they made a northern snow iguana. We've got native skinks, but that's about it for lizards in PA.
MisterHoodoo, tree-ratsniper and Young Blacksmith like this. I'd try it! I remember using my old plastic -stock Crossman pump airgun to shoot European Starlings in the backyard. Anything helps when dealing with invasive species! I would think it would taste kinda like alligator? Goldfish crackers will bait them in close,they will also freak out German tourists walking under their lounge chairs. I tried to warn her but she thought I was hitting on her. I remember in Crocodile Dundee when he asked his aborigine buddy if he was enjoying his iguana. He replies, “naw, needs garlic!” I would give it a try. They ought to treat this like the lionfish and python and encourage people to hunt them and restaurants to serve them. I can vouch for this, when I was in my early 20s a buddy had one that was a pet. Somehow or another the damn thing latched onto one of my fingers & wouldn't let go! I tried to remove it gently & then after seeing my blood begin to trickle, I started to get a little irritated! We tried to remove this thing for several minutes but it wasn't giving up. I pulled out my folder to commence cutting the damn thing's head off and my buddy said hang on...It took 3 people & two straight screwdrivers to pry that thing off of my finger. My girlfriend at the time immediately produced a cup of hydrogen peroxide to soak my finger in (didn't want to chance it, they are related to Komodo dragons). My finger was bit up pretty good, should have probably had a few stitches. This iguana wasn't very big, maybe a foot in body with another foot or so in tail. I wouldn't want to get bit by a larger one! On a side note, the thing died about a month later, my buddy says it was from all the heavy-metals it ingested via my blood! Years ago we did a joint operation with a Central American Navy, I was repairing their radios on a patrol boat when lunch rolled around. I was invited to lunch with the crew and they served iguana that one of the crew bagged early that morning. It was very tasty, kind of tasted like a mix of gator and shrimp. Actually that was "Goanna" or monitor lizard of which there are about 25 varieties in Australia and considered a delicacy by Aboriginals there. Iguana and Goanna sound very similar. 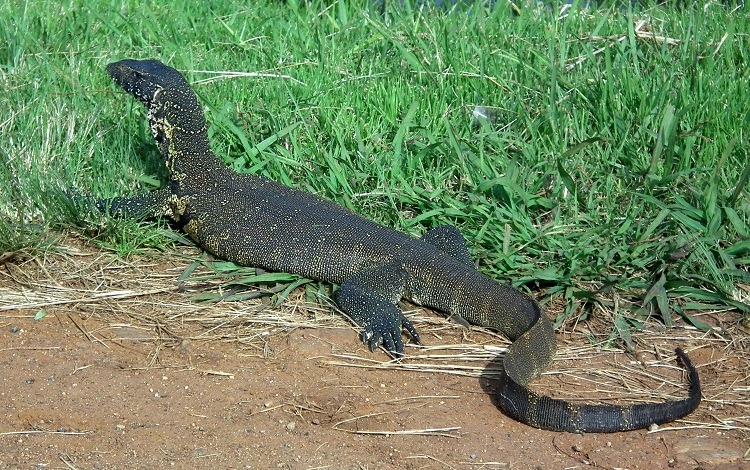 Speaking of which Nile Water Monitor lizards are also not an uncommon sight in SW Florida too where my kid sis lives. Many claim their pets have been eaten by these large lizards. I would chance eating a herbivorous Iguana but not a carnivorous Monitor, just me. These guys are mostly all dead now. But they died of old age and accidents not eating this lizard. I’ve never had one but I’d be game. I assume like most reptiles it is rank with salmonella so the carcass and meat would have to be handled and cooked carefully, but that’s just as true for a chicken. While I was looking for that astronaut picture I found these two of alligators in hiding. These are scary when you consider an animal that is able to kill and eat a man can disappear so completely.